URT, available through Glyn High-Tech Distribution , have introduced the TMS-9083 A/D driver board to make it easier to interface PC VGA and analogue video signals (NTSC/PAL /SECAM) to digital TFT LCD modules. 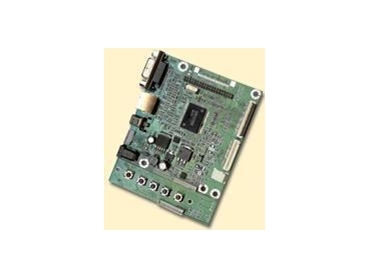 The TMS-9083 A/D driver board is a compact sized panel driving board, which can support PC VGA input and video input. The board for PC VGA input can allow from 640x480 at 60Hz to 1024x768 at 75 Hz input, and the video input can allow for NTSC/PAL/SECAM video for Composite or S-Video input. For the panel display output, the TMS-9083 A/D driver board can support small sized TFT LCD panel from URT or other manufacturers with resolution from 320x240 to 1280x768 panels and with CMOS-TTL/TTL-TCON/LVDS interface. The output resolution and interface can be decided by internal firmware setting and optional.